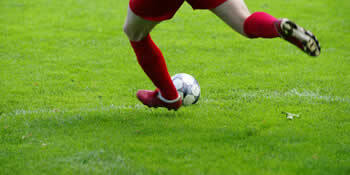 The “inside of the foot” or instep pass is the safest soccer pass. Because of the large contact area between the ball and the foot, very precise passes can be executed. The “inside of the foot” pass also allows for exact passing and volleying to a partner. We describe here the proper technical procedure for a stationary or rolling ball. Instructions for correct technical execution of the instep pass: the differences between the low cross and high pass are marked in bold. A. The ball is approached frontally. There is no bending of the leg. 2. The body weight is shifted onto the leg. 3. The supporting leg is slightly bent and the toes are pointing in the direction of play. 1. Swing the kicking leg loosely back, while turning it slightly outward. 2. The toes are also pointing outward. 3. The ball is hit exactly at the centre of the instep. 4. During the pass, the kicking leg swings loosely through. 3. Upper body is not over the ball. (high = upper body over the ball). 4. Area of contact is off-centre.